We realize that the main factor to take into account is the safety of all of the students. Teenagers can lack discretion and we realize that. That is why we take every precaution in making sure that everything will go extremely smoothly and everyone will arrive safely at their homes at the end of the evening. We know the last thing you want is for your son or daughter to drive themselves or to ride with a friend. So, we have the perfect solution. 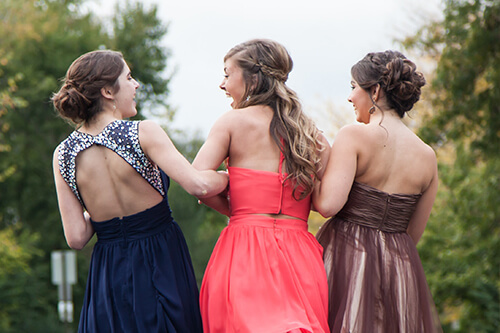 One of our fabulous limo buses will provide you with peace of mind while the teenagers have a blast as a group. Picture this, your son or daughter and a group of friends all get to be together for the entire evening. That means being picked up at a location of your choosing and riding together to all of the venues associated with prom. One of our amazing limo buses will take care of their transportation needs. We know you are probably worried about cost, but we have a major suggestion for you. Have the group split the cost. We have professional chauffeurs on staff who are certified and who will make sure your son or daughter get to their venue and back in one piece. Our drivers know the area roads like the back of their hands and they also have GPS. And the amenities we have installed will have the teenagers enjoying the time of their lives. We know that teenagers love electronics and there are many great gadgets to play with on our limo buses. The tone is set with LED color changing party lighting all over the interior and exterior. We know music needs to be a part of this experience and we have installed a concert quality stereo. And yes, they can bring their favorite songs with them. The custom wood dance floor with dancing pole is going to get the juices flowing as well. How about multiple televisions, soft wraparound leather seating, and granite topped bar areas. If this isn't a win-win situation, we don't know what is. When it comes time to pursue something special like this for your family, don't you want the best. And we don't mind bragging that we are the best in the business. And to have th epeace of mind we can provide is worth something as well. Our customer service office is open 24/7 for your convenience so don't hesitate to call anytime. If you have questions or concerns, we are here to answer them. When you feel you are ready, one of our agents will be happy to walk you through the booking process. It will be our pleasure to serve you and your teenager and their very special event. Call us today.